In an exclusive residential area, Fraser Suites River Valley provides a free daily one-way shuttle to popular Orchard Road and Suntec City. Fully furnished apartments come with a kitchenette and free in-room Wi-Fi. An outdoor pool is available. Featuring modern designs, all apartments include a flat-screen TV, iPod dock and DVD player. The master bedrooms have a private bathroom with bathtub, separate standing shower and free toiletries. A washer and dryer are provided in the larger apartments. Right next to Valley Point Shopping Mall, Fraser Suites River Valley is a 15 minute walk from Tiong Bahru MRT Station and Tiong Bahru Plaza. It is a 30 minute drive from Changi International Airport. One free parking space is provided per apartment booked. Guests can relax at the steam room and sauna, or exercise at the 24-hour fitness center. The Retreat features massage chairs and foot massage facilities. There are also barbecue facilities, a children's wading pool and a children's playroom. A free buffet breakfast is provided on weekdays (except local public holidays) at The Dining Room, which offers outdoor seating. On other days, a breakfast menu is available for an extra fee. Room service is available from 12 pm - 9 pm, providing light snacks and finger foods. 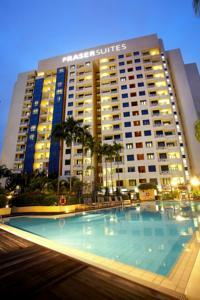 Rooms: Apartments: 255, Hotel Chain: Frasers Hospitality. Free! One child under 5 years stays free of charge when using existing beds. Free! One child under 2 years stays free of charge in a baby beds. One child from 6 to 11 years is charged SGD 27.50 per person per night in an extra bed. One older child or adult is charged SGD 55 per person per night in an extra bed. The maximum number of extra beds/baby beds in a room is 1. Any type of extra bed or crib is upon request and needs to be confirmed by management. Supplements are not calculated automatically in the total costs and will have to be paid for separately when checking out.